The criminal justice field is made up of many rewarding jobs—some of which students can begin training for by obtaining a degree from criminal justice schools in Virginia. From police patrolmen to state Supreme Court justices and everyone in between, each professional plays a role in making the system work, and criminal justice programs can lay the founded students need to fulfill that role. Continue reading this page to find out which careers are popular among graduates, as well as their earning potential and projected job growth. After Criminal Justice School in Virginia: What's Next? 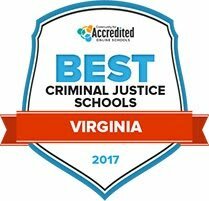 Wondering which criminal justice schools in Virginia are among the best? Use the ranking tool below to find out. This resource allows users to find the most reputable programs based on tuition rates, teacher-student ratios, and enrollment numbers. Explore the top criminal justice schools in the state for 2017 below. Dabney S. Lancaster Community College (DSLCC) offers a criminal justice program for students interested in entering the field. Students may choose to follow one of the four criminal justice paths offered at DSLCC: administration of justice, forensic science, law enforcement and administration of justice with a special emphasis in forensic science. An associate of applied science degree or a certificate is offered for all four programs. DSLCC students use the Blackboard learning system to manage classes and communicate with professors. Blackboard is also used to take tests and quizzes for criminal justice classes at DSLCC. Students interested in entering the criminal justice field may choose to enroll in the police science program at Mountain Empire Community College (MECC). Several courses for this program include Criminal Law, Investigation, Juvenile Delinquency and Police Administration. Upon completion of the two-year police science program and the 67 required credits, MECC students may earn an associate of applied science degree in police science. MECC students are offered a variety of student services including career services and disability resources. Financial aid is offered through FAFSA, and qualifying students may choose to apply to one of MECC's scholarships. Danville Community College (DCC) offers certificate degrees and associate of applied science degrees to students interested in pursuing a career in the law enforcement field. The administration of justice corrections, administration of justice law enforcement and administration of justice protective services all offer associate of applied science degrees. The law enforcement, protective services, cybercrime investigation and corrections programs all offer certificates upon completion. All certificate and degree programs may be completed within a two year span, and all programs require 44-68 completed credits. FAFSA financial aid and scholarships are offered to qualifying students at DCC. Prospective students who wish to pursue a degree or certificate in law enforcement administration or criminal justice may choose to do so at Southside Virginia Community College (VCCS). Associate of applied science degrees, certificates and a career studies certificate are available for students who complete the law enforcement administration or criminal justice programs at VCCS. The programs may take one or two years to complete, and students are required to finish six to 60 credit hours based on the certificate or degree program. VCCS offers financial aid through FAFSA and grants and scholarships are available to qualifying students. A five-semester program in administration of justice is offered at Southwest Virginia Community College. Criminal justice students who complete the minimum of 66 credits may earn an associate of applied science degree in administration of justice. The community college emphasizes that students interested in enrolling in the program must recognize that criminal background checks are required, and that the program is often physically demanding. Classes offered in this program include criminal justice ethics, narcotics and dangerous drugs, and forensic science labs. Available student services at Southwest Virginia Community College include career and disability resources, and tutoring services. The Criminology, Law and Society program at George Mason University is designed to equip students with the basic skills to perform and excel in various criminal and civil justice roles. Both the undergraduate and graduate programs are comprised of a sequence of challenging courses that blend traditional learning methods with hands-on instruction. At GMU, students can expect to learn from experienced professionals in criminal justice in various areas such as juvenile justice, civil liberties, policing strategies, treatment programs and crime prevention. The department of sociology at Hampton University promotes a conventional teaching methodology of society with a heightened perspective from minority communities that encourages new conceptual ideas. Within this department, the university offers a bachelor of science in criminal justice and criminology program. This degree path requires a traditional general education base and before entrance into the competitive criminal justice program. Students must complete an undergraduate research thesis to help develop crucial critical and analytical thinking. The criminal justice and criminology BS at Hampton provides students with an education for careers in all levels of public service. For students looking to kickstart their career in criminal justice, Marymount University provides some unique experiences for the next generation of law enforcement, lawyers, forensic scientists and more. Conveniently neighboring Washington D.C., Marymount University requires students to complete an internship and many have gained professional experience at agencies such as the FBI, NCIS, and in Washington courtrooms all before graduation. Faculty members in the criminal justice department have diverse backgrounds in the field and tenured faculty contribute to research and scholarly journals. Students can earn a bachelor of arts in criminal justice or a bachelor of science with a focus in forensic science. Studying criminal justice at Virginia State University prepares students for a career in one of six major focuses: research, forensic science, juvenile justice, corrections, law enforcement or court procedures. VSU offers a bachelor of science and also a master's degree program in criminal justice. The undergraduate program provides the founding blocks of a criminal justice education combined with the mandatory general education courses. The master's program can either ready a student for advanced employment opportunities or entrance into a doctoral program and students can either choose a thesis or non-thesis track. The department of criminal justice at Radford University encompasses all levels and disciplines within the field to give students a rounded approach to their education. Offering a criminal justice bachelor of arts or bachelor of science degree, students can tailor their education to their desired future career. For those interested in an investigative emphasis, the department offers a minor in forensic science. A matriculation program also exists for associate degree holders from Virginia Western Community College called BS 2+2 which promotes higher education for working individuals in the criminal justice department. The BS 2+2 program runs only on afternoon and night class schedules. Looking for criminal justice schools in Virginia can be a time-consuming process, and it’s often difficult to know whether or not a college is the right fit. To get help with this process, use the search tool below, which allows users to find colleges based on degree levels, tuition cost, and student population. Also, prospective students can look for public vs. private colleges through this resource. Salaries and job opportunities are huge considerations for students earning degrees from criminal justice schools in Virginia. The table below provides that information by outlining how many people are employed in specific criminal justice jobs and the average median salaries for these positions. Also, there is information on the level of education required to obtain employment in different careers. Students attending criminal justice schools in Virginia need to have confidence that they’ll get a return on their tuition investment. The good news is, some of the most popular careers command salaries that rival national averages and have stronger growth potential. Review the tables below for more information on national and state-specific salary statistics and job growth projections. Wondering where the jobs are? Want to know which areas of Virginia pay the highest wages? The table below provides that information. Find out which locations have the most employees and the highest salaries for protective service and legal positions. In addition, there is a list of some organizations where criminal justice graduates may be able to find employment. This page has step-by-step information on starting an LLC in the state. Budding entrepreneurs can find information on how to apply for a business license, choose a company structure, and register a business name on this page. The U.S. Small Business Administration provides information to help people begin and operate their companies. This chapter of the ACC services the commonwealth of Virginia, suburban Maryland and Washington D.C. to provide information and resources to corporate legal professionals. The Virginia Chamber of Commerce is a membership-based entity that provides resources for businesses and advocates for business interests in Virginia government. This organization offers support for new and existing businesses that want to start in or come to Virginia. This page on the Commonwealth of Virginia’s State Corporation Commission helps citizens locate registered business entities. Virginians who want to pursue a corrections career can find job postings from the Department of Corrections on this page. Members of the Virginia Correctional Association (VCA) can participate in the organization’s training programs, conferences, and committees. In addition, the VCA has numerous publications to keep correctional professionals abreast of developments in the field. Includes information on correctional facilities, victim services, and the accomplishments of the agency. The DJJ serves the community by offering information and resources about Virginia’s juvenile justice system, including correctional centers and programs. This directory provides information about programs that help ex-offenders reenter into the community. Serves the needs of court clerks in the state. The VCRA has been helping court reporters in Virginia enhance their skills since 1967. The website for the Virginia judiciary contains information on the different types of courts in the system. In addition, users can find out about the programs run by the judiciary, including mediation, parent education, and drug-treatment courts. VACCR is a collection of nine non-profit conflict resolution centers that work to help Virginians resolve conflict constructively in their community. The Virginia chapter of the Court Appointed Special Advocates provides assistance and advocacy for abused and neglected children. This nonpartisan grassroots organization aims to promote an equal justice system for all communities in Virginia. This state website allows users to search laws in the Code of Virginia, the Administrative Code, and the State Constitution. Low-income Virginia residents can receive pro bono representation for civil matters through the VLAS. Members of the Bar have access to numerous invaluable resources, such as continuing legal education courses, free dispute resolution services, and help with ethical dilemmas they may face during the course of their careers. This statewide organization connects paralegal networks from around Virginia to share resources, provide information and attend conferences. This directory provides links to organizations that provide legal assistance to low-income members of the community. The AG provides legal counsel and representation to state entities and employees. The AG also works to ensure consumer protections are in place throughout Virginia. Promotes high standards among Virginia’s private investigators and provides professional development to ensure that they meet these principles. Agency provides police staff for state employees and elected officials. This site has information on the work of the Virginia State Police. The VSA provides information, news, networking opportunities and resources to Virginia’s sheriffs. The NVCJA website has information about training opportunities for Virginia’s law enforcement professionals. Jobs from the Virginia Department of Game and Inland Fisheries are listed on this page. When wild animals need medical care, The Wildlife Center of Virginia provides treatment. Since it opened its doors in 1982, the organization has helped 70,000 animals. DGIF manages wildlife, recreational boating, and inland fisheries around the state. Information about law enforcement career opportunities in Virginia State Parks can be found on this webpage. Conservation police officers enforce the laws that are in place to protect wildlife.